South Koreas largest cinema operators are looking abroad for growth as the number of overseas cinema admissions overtakes that of Korea this year for the largest operator CJ CGV. Both CGV and Lotte have already a significant presence in several major Asian and European markets, but with domestic admissions declining the urgency to expand overseas will intensify in 2018. Korea has been shaken in the past year by the corruption scandal that led to the ousting and arrest President Park Geun-hye, jail for the de-facto head of Samsung and the corruption trial against the chairman of the Lotte Group. As of November admissions in Korea were trailing last year by 870,000 and the year is expected to finish at the same level or slightly below that of 2016. This is part of a long term trend of stagnation that saw total tickets sold cross 200 million in 2013. “But the growth slowed, with the number rising only to 215.069 million in 2014 and 217.3 million in 2015, and slightly dropping to 217.026 million in 2016,” Yonhap news reports. The number of cinema increased from 331 in 2016 to 352 as of November this year, with several significant opening and re-openings, including the world’s largest IMAX multiplex in the CGV Yongsan Ipark Mall. There has also been a strong push for innovations such as CGV’s 4DX, ScreenX, ‘Cultureplex’, VR Park, V-Busters and comic café ‘Roller’. The situation and outlook was laid out at the ‘2017 CGV Film Industry Media Forum in 2017’ at the CGV Yongsan Ipark Mall under the theme of ‘2017 movie market settlement and 2018 trend forecast’. CJ CGV’s CEO Seo Jung said that movie watching in Korea is changing drastically due to “OTT (Over The Top) expansion”, “social media spread” and “population decrease”. His aim is for CGV to provide a place that offers “more than a movie,” with more innovation such as 4DX and ScreenX coupled with synergies from new cultural pushes. Further to this CGV will open 22 independent and art-house screens in 18 cinemas across Korea in 2018. Yet the biggest push will be outside of Korea, with growth in emerging markets to make up for any further stagnation in the domestic market. More than 200 million visitors world-wide went to a CGV cinema in the past year, with overseas overtaking domestic for the first time. CGV is looking at listing its Vietnamese subsidiary next year, signed a joint-venture deal to open 33 cinemas in Moscow in the next few years and has even been linked to a potential acquisition of Vue. In the meantime it has continued to open more cinemas in the US and elsewhere, with the stated goal of having 10,000 screens across the globe by 2020 through organic and in-organic growth. 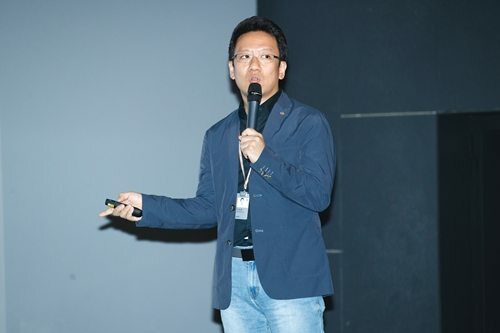 Looking at trends in the domestic market, Lee Seung-won, the director of CJ CGV Research Center, noted that movies with more than three million viewers decreased while those with more than two million viewers increased considerably. As a result, the period of maintaining the number one box office and the period of reaching 70% of the final number of audiences are getting shorter. The number of movies in the box office for the first week in November this year is 22, which is a big increase from 9 in 2013. That means the number one movie is changing frequently.The period of reaching 70% of the final audience also decreased from 8.5 days in 2013 to 6.8 days in 2017. This means that movie box-office is gradually decided in a short period of time, and it becomes a factor that adds difficulty to movie marketing. Lack of interesting moves is blamed on softening demand this year, but longer term the loss of ‘core audiences’ represent fears for a significant market contraction by 2030. Worryingly the proportion of teenage cinema goers is steadily declining, with the top ten visitors accounting for 4.3% in 2013 but fell to 2.8% in 2017. However, the number of over-50 visitors is steadily increasing from 5.8% in 2013 to 10% this year. There are also more people going to the movies by themselves. “Changes in the demographic structure of young people, new trends in leisure activities such as restaurants and cafes overlap, and a new methodology will be needed for the audience to find cinemas in the future,” Lee Seung-won, director of the center, is quoted as saying. CGV’s competitor Lotte has confirmed that it will expand its presence in Vietnam and Indonesia, partly to offset risk in China’ Lotte cinemas and malls were boycotted in China this past year during a chill in Sino-Korean relations in 2017 over the deployment of THAAD missile defence system in Korea on Lotte-owned property. Lotte will both ramp up cinema openings and also enter film production in Indonesia as part of a two-prong approach. Lotte notes that Indonesia’s GDP per capita is USD $3,900 compared to just USD $2,300 for Vietnam, yet Indonesia has just 1,300 cinema screens compared to 2,820 in Korea, which has one-fifth of Indonesia’s population. Lotte estimates that Indonesia will grow to over 10,000 screens, with Korea having an edge in the country due to the popularity of its music, TV dramas and food. “When conducting overseas business, Lotte pursues a large-scale complex development projects in which hotels, department stores, marts, restaurants, and movie theaters all join together,” Sedaily notes.